Ben Finkel at Ngogo, Kibale National Park, Uganda. Face masks help prevent humans from transmitting harmful pathogens to the chimpanzees. Researchers also maintain a minimum seven-meter (21 feet) distance. Photo by Caitlin E Lawson. Humans are especially long-lived animals. Even in the absence of modern medical care, we live longer than any other primate. 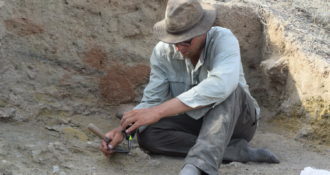 Explanations for how we evolved our longevity invoke other unique human features like the importance of grandmothers or a coevolution with our intelligence. Yet it turns out that our fellow apes like chimpanzees also tend to live twice as long as other primates like monkeys and lemurs. 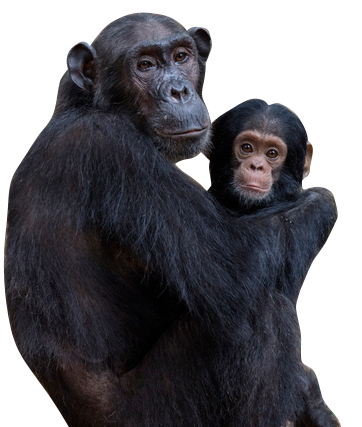 We recently learned that chimpanzees age more similarly to us than previously thought, reaching over 60 years in the wild. Still, a lot of our understanding of aging comes from studying human societies, which share food extensively and care for the elderly, things that wild apes don’t do. So what does it mean to be an aging ape in the wild, who has to fend and forage for themselves? 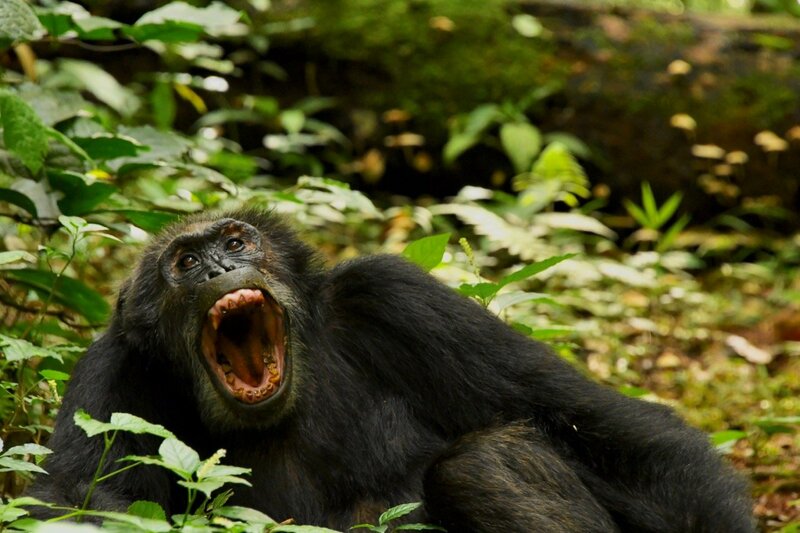 Ngogo chimp Bartok (46) yawns, which shows off his wearing teeth including a broken left canine. Photo by Ben Finkel. This is the big questions guiding my work with wild chimpanzees as I spend a year at Ngogo in Kibale National Park, Uganda, conducting my research as an anthropology PhD candidate at the University of Michigan. I go into the forest daily to observe some of the over 200 chimpanzees across two communities at our study site. I follow adult males ranging from 21 to 53 years old. Every day I grab my binoculars, GPS, and at least one chocolate bar to find and follow these chimps who have been studied pretty much every day for 25 years. 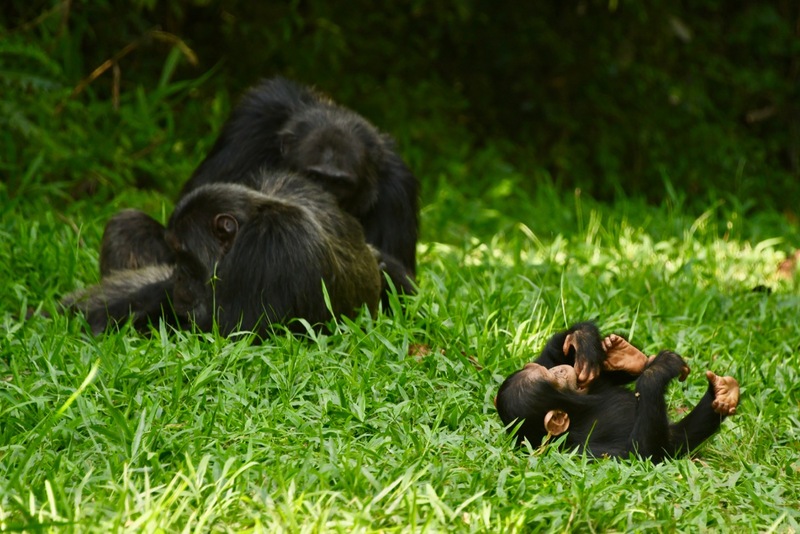 In particular, I think male chimpanzee aging is interesting because males reproduce late in life, have noticeable drops in weight between 30 to 40 years of age (depending on the community), and sometimes become less social. To what elements of aging can we attribute these observations? 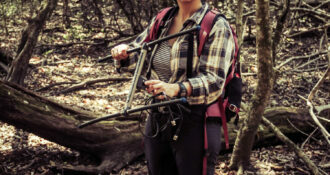 Because food is a daily requirement, and the ability to acquire nutrients depends on body condition, I am investigating relationships between aging, frailty, and foraging ability. For instance, do old chimpanzees with worn teeth chew less efficiently? Do aging bones and muscles hinder their climbing? If they have a harder time getting enough nutrients, does this explain why we may see older males lose weight and become less social? Denis (3) plays in front of the current alpha, Jackson (29) and the former alpha, Miles (38). Photo by Ben Finkel. Answering these questions means that if you came across me in the forest, I might be jotting down the type of fruit I see the chimps eating, counting the number that goes into their mouth, peering through a clinometer to figure out how high up in the tree they’ve climbed, collecting urine for later energetic assay, or keeping track of how many chimps are around throughout the day. 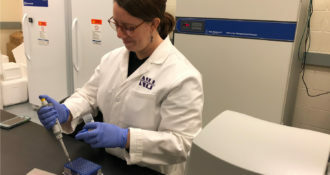 Since most work on aging happens in the lab or with short-lived organisms, I hope that addressing my questions will clarify what it means for a long-lived animal to age in the wild. Moreover, to get an idea of how human lifespans came to be, we have to know more about longevity – and its limits – in our fellow apes. 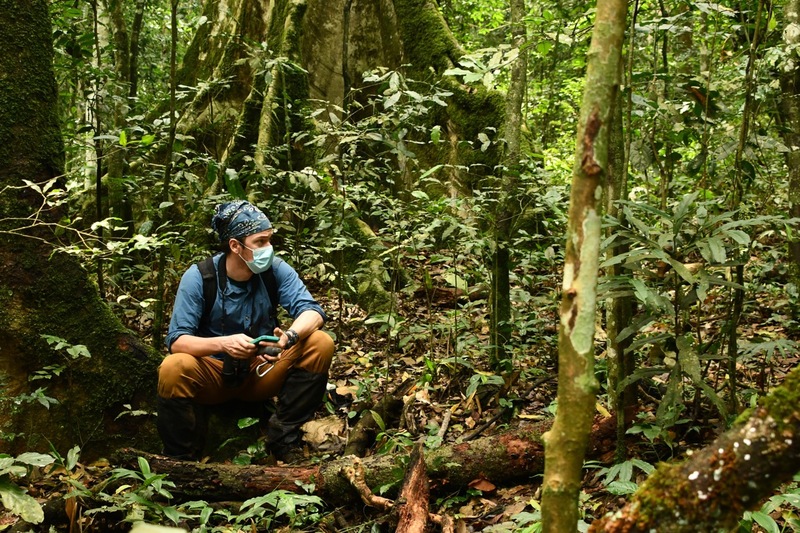 For more chimps, aging, and forest life, you can follow Ben on twitter @Benjamin_Finkel.